Former Isle of Wight councillor and prospective parliamentary candidate in 2017, Daryll Pitcher has confirmed his position in the EU elections. The Ventnor councillor said he joined the Conservatives because he thought it would help him get more done for the town, but it has not. Former Isle of Wight UKIP councillor says he has no doubt that the most recent GCSE and A-Level results come as a direct result of the "failed policy” of school reorganisation from three tiers to two. Not satisfied with Ofsted chair, David Hoare's apology given earlier in the week, a UKIP leadership candidate questions how schools will get a fair hearing when the chair holds "such biased views”. UKIP say they will watch those tasked with negotiating EU withdrawal to make sure they get the best deal for Britain at the negotiating table. 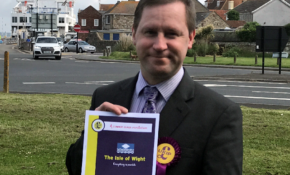 With the Isle of Wight council elections less than a year away, OnTheWight asked leaders of all the political groups for their “view on how things have been since the last election and your hopes for the next 11 months”. Here’s what UKIP's Daryll Pitcher had to say. OnTheWight has invited members from each political group or party on the Isle of Wight council to share their impressions of how the first six months of an Independent-led Isle of Wight council is working.